The Toy Box Tiny Home is the product of immense thought put into a home that would reflect environmental and energy efficiency standards. This 140 square foot dwelling is now on sale for $48,000. This miniature mobile’s exterior is constructed with corrugated fiberglass cubes, which were then wrapped with cedar for the “toy-box” effect. The natural cedar siding juxtaposes the colorful fiberglass, creating and playful balance between the rustic and urban aesthetics of the home. The roof is made with energy efficient thermoplastic (TPO), and the ample windows visually open up the small space while creating natural ventilation. The interior of the home uses plywood on a sloped ceiling along with the walls and the floors for that classic toy box look. The space uses blown in blanket insulation (BIBs) and radiant floor heating for eco-friendly temperature control, as well as natural ventilation (cross and stack) which allows the home to be comfortable year-round. Natural insulation gives the home extra sound reduction, allowing for a relaxing home environment. The furniture makes the most of the 140 square foot space. The living room contains 8 cubes that can be used as both storage bins and seating, not to mention that they are easy to configure into a number of different forms. The cubes can become a sofa, table, or even a bed. The kitchen incorporates stainless steel on its counter and sink. The under-counter fridge and hidden pantry are cleverly placed to create space. The bathroom is cleverly designed to have the faucet transform into a showerhead. Finally, the bedroom is included as a loft that you can access through a ship’s ladder. The light switch in this loft space allows the inhabitant to conveniently turn off all the lights in the house. And for maximum energy efficiency, this house uses hidden LED strips lighting in every single room: there’s LED lighting strips tucked under the dry food box shelf in the kitchen, the counter in the bathroom, and even in the corners of the living area. 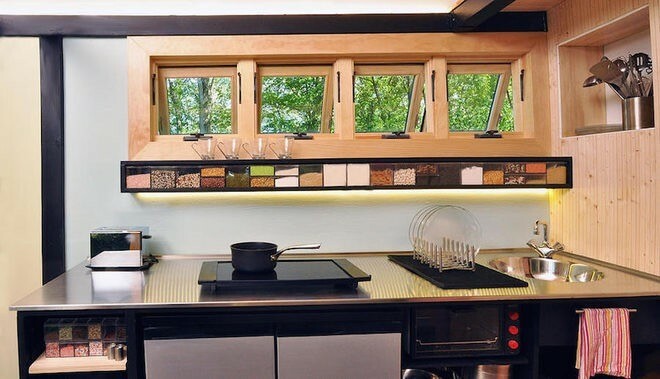 It’s amazing to see that LED lighting has been recognized as an environmental and energy conserving material that it is also incorporated into this tiny home, making it the very embodiment of energy and cost effectiveness.